4.2 out of 5 based on 11 bloggers and 0 commenters. 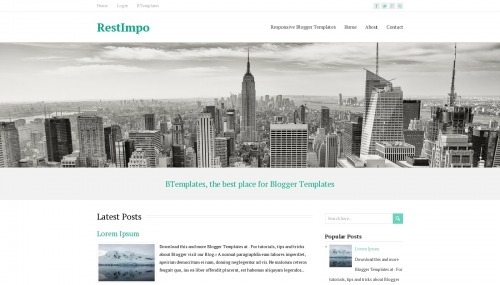 RestImpo is a free blogger template adapted from WordPress with 2 columns, responsive design, magazine-styled, right sidebar, minimalist, footer columns, social bookmarking icons, posts thumbnails, a background pattern, related posts support, well designed threaded comments and neutral colors. Excellent template for blogs about business, culture or news.